Advances in mobile technologies and pervasive computing provide new opportunities for supporting and enhancing learning that goes beyond that which has been made possible using the desktop PC. “Visualizations” can be presented or accessed via mobile devices or ambient displays at opportune times that can be pertinent to an ongoing physical activity. 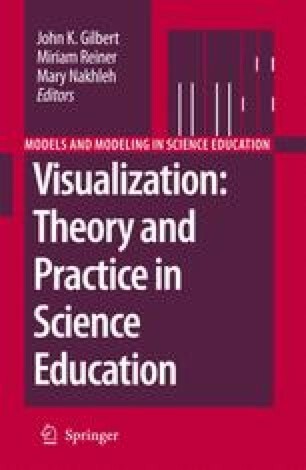 This chapter examines how external representations can be designed, accessed and interacted with to facilitate scientific inquiry processes, through using pervasive and mobile technologies. It begins by providing an overview of how different technologies have been used to support learning about and the practicing of scientific inquiry. Next, it describes the kinds of representations that are considered most effective to use. Two case studies are then presented that show how small-scale and large-scale representations were successfully integrated and used by students to understand and hypothesize about habitats and environmental restoration.